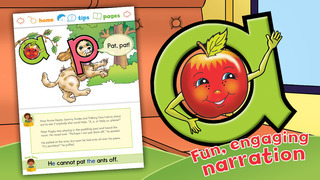 Letterland Stories: Annie Apple is an engaging interactive story that can support young children with learning to read. It provides children with an opportunity to practise their decoding skills as well as recognising letter shapes and identifying letter sounds. An educational app to help develop an enjoyment in reading whilst also providing an opportunity for decoding reading practice and letter shape and sound formation. This app is part of a series which features 10 different apps based on the letters of the alphabet. These are grouped with A and Z as separate apps then all the others grouping 3 letters together. 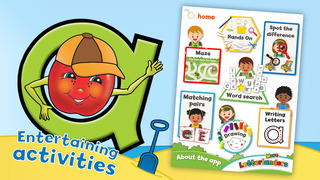 In their app blurb the developer, Gazoob, explains that there is a popular order for learning sounds and letters when it comes to initial reading practice. It explains the order and gives further details about how its apps provide a good basis for reading development. If each of the apps follow the same pattern as this one then I can certainly see how valuable the series could be to both parents and schools as another tool to encourage successful reading practice. On opening the app you are given a number of options from the home page. This includes a story, a further page of activities, another page taking the user to a song and video and two further links about the app and also the other apps available in the series. The graphics of the app seem very familiar and very much in keeping with the types of books and apps that children will be using. This gives the user that feel of familiarity and so also allows the user to feel comfortable in using the app. In the story section, the first selection on the home menu, you are taken to the main story. Here you have the option to have the story read to you or to be able to read it yourself. This is an excellent feature allowing the user to access the story at different entry levels depending on their ability but also on what they want to use the app for. The story is clearly written by a language expert but this is not at the cost of the story which is still engaging. The illustrations are also well pitched with enough of an interactive element to continue the user’s interest but not too much that it becomes a distraction. At the top of the page the user has the option to return to the home menu, to select the page of the story they want and also a tips link. This link explains some of the interactive elements on each page allowing the user to use the app to its full potential. Back on the home menu the user can discover a number of different activities related to the story. These are a mixture of game based activities on the app, including a maze, word search, pairs game, spot the difference and drawing section but there are also craft ideas that can be used outside the app and a further link that takes the user to letter formation practice. The final additional element from the main menu is a link to a song and a video. These both further compound the letter of the book giving the user a short song that they can sing to help them remember the sound that the letter makes. All these elements; the video and the activities, all work towards making the act of reading enjoyable and giving further opportunities to practice and learn the letter, sound, use and formation. The final links from the homepage contain further information about the app and the developer. The first lists information that includes a link to support via an email allowing the user to contact the developer should they need to. One of the links from this page also explains clearly how the app works and how the user can make the most of all the elements in it. Should the user wish to they can also follow a link to all the other apps in the series that covers all the other letters of the alphabet. Overall this is a very useful app that can help support children in their initial reading practice. It allows the user to enjoy the art of reading whilst also discovering more about letters and sounds through extra activities, bring alive the magic that reading can bring. 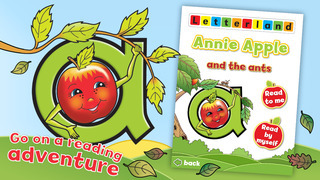 Go on a reading adventure with Annie Apple! Features “Annie Apple and the ants” - a carefully designed imaginative story which allows you to share the reading experience with levelled sections for your child to read with minimal support. • Narration can be toggled on or off. 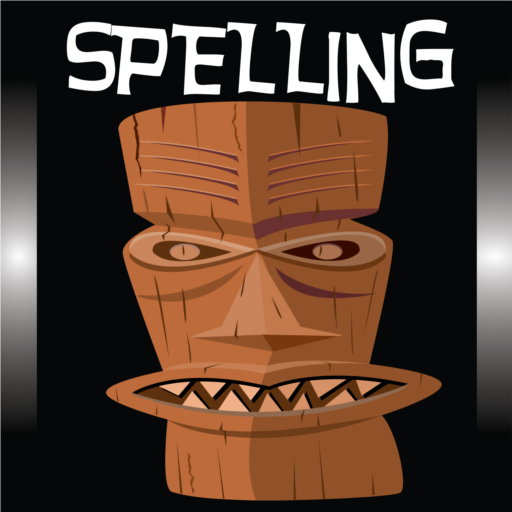 • Features the letters ‘s’, ‘a’, ‘t’ and ‘p’. • Speech bubbles highlight decodable words for beginner readers – a, pat, sap, tap, tapas. • Short sentences for early readers made up of words using the 26 letters in their most phonically regular form. • Tap words in the short sentences to hear their pronunciation. 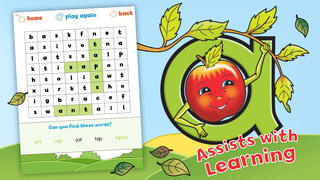 • Tap any Letterland character to hear their name and the sound they make. • Simple comprehension questions at the end of the story. • Fun activities including a maze, word search, spot the difference puzzle, matching pairs game and drawing activities. • Trace lower and uppercase ‘a’ to build towards independent writing. Introduces the correct strokes for writing. • Handwriting song for the letter ‘a’ to help learn letter shape formation correctly.